I still remember the excitement of going out to purchase Lyrita records. I cannot recall their price back in the early ’seventies – but I guess it was around the £2 mark [it was a premium priced label at £2.76 in 1975 - LM]. I certainly know that ‘saving’ was an important part of the process. My first acquisition was William Alwyn’s Third Symphony coupled with The Magic Island – still two of my favourite British works. More than any other possessions, I can recall where I bought virtually every Lyrita record. I must have been seriously impressed! I had read in the musical press that a large choral work by Gerald Finzi was about to be released. In 1975 I was living in Glasgow and the main record shop was ‘Symphony One’. I pestered them every day for a fortnight until the record finally arrived. I rushed home after work and put it on the turntable. I was blown away by the music and strangely, for an eighteen year old, empathised with the Wordsworth-ian words. The only down-side was that I did not have the company of the girl who I was madly in love with. I wanted her next to me for that first hearing of one of the great masterworks of English music. Sylvia loved British Music but alas she never came to love me! This is not the place to dissect the Intimations of Immortality – or ‘Immorality’ as Mrs Malaprop would have called it. However there are two reasons why this is a great work: why this is a fundamental cantata for listeners and singers alike. Firstly, the anti-pastoral school of music would define Finzi as one of their ‘cowpat’ composers. And of course that judgement is entirely wrong. There are few cows, gates or rustics in any of Finzi’s music. The key components of his compositions are retrospection and a deep feeling for the transience of life. It is not a negative emotion as such, but nearly all of Finzi’s music has a valedictory feel to it. It may be the Bach-like movement of parts or simply the orchestral colouring or the Hardy-esque sentiment of much of his music. Wordsworth had written a neo-platonic poem that posited the immortality of the human soul. He insisted that this soul had pre-existed in some alternative state prior to its present condition of ‘occupying’ our bodies. After our death it will return to that ‘paradise’. Wordsworth considered it an axiom that a child is nearer to this bliss than the full grown woman or man. Its thought-scape has echoes of Thomas Traherne’s ‘Centuries’ which Finzi had also set to music in Dies Natalis. Intimations of Immortality is a description of the response to the world by an adult but through a child’s eyes. And in this Wordsworth is successful; it is one of his better poems. Secondly, Finzi’s music is varied harmonically and is rhythmically challenging. It is a fine essay in successful word-setting. It is definitely not pastoral although there are moments of calm and repose. The sources of this music are largely Finzi’s own; however the listener will hear echoes of Parry, Vaughan Williams, and even Walton. Intimations presents the listener with a challenge akin to the Cello Concerto. This is not easy music: it is not what many listeners would expect from the pen of this composer – but it is an entirely rewarding and fundamentally uplifting work that explores some of the deepest concerns of humankind. Other reviewers on MusicWeb have compared all four recordings of this work. I will not add to this. What I will say is that although the versions by Naxos, Chandos and EMI have great value and are important additions to the CD repertory, I believe that Lyrita wins by a long chalk. Perhaps it is simply the fact that it is the version I first came to know? However it may be I find that Ian Partridge’s singing totally and utterly epitomises this work for me. This is the stuff of which heaven is made. Patrick Hadley was a York discovery for me. I was browsing in Banks Music Shop – in the days when it was still ruled over with a rod of iron by ‘Ma Banks’. Those readers who remember her will recall the fear and trepidation she instilled in both staff and customers! Anyhow I spotted this record by a composer of whom I had never heard. But such was my trust in Lyrita that I raided my wallet and walked out of the shop with a brand new listening experience under my arm. I have to say that I was not terribly impressed with the work on first listening, way back in 1979. It has been a piece that I have come to love over the years. Whilst writing this review I set to wondering what didn’t quite click for me nearly thirty years ago. I guess that I was confused by a ‘choral’ work that did not have any singing until the last movement. I had failed to spot, or at least register, the title - a Symphonic Ballad in A minor! Secondly I felt that the text was somewhat depressing. But that was a long time ago – before I had read Thomas Hardy! What Hadley has given us is a perfectly balanced consideration of life – both in general and in countryside particular. He meditates on the swing of the seasons of nature and the short span of a man's life. The last movement of this work epitomises a sense of loss, of transience and of sheer sadness. Thomas Allen’s solo and the choral meditation are profoundly moving. Yet the overall mood of the music is less fraught. The first three movements include an almost impressionistic overview of the countryside and the thoughts of those living there and those who have a propensity to visit. It is a compellingly fine, reflective and memorable symphony that must continue to be in the canon of English music - essential listening. I have no doubt that this is Patrick Hadley’s masterpiece. It is easy to play hunt the influence in this great piece. 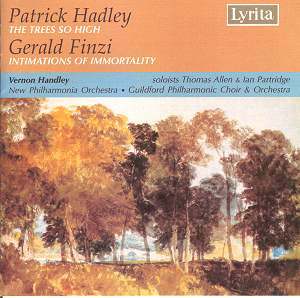 Cognoscenti will spot nods towards Fred Delius and Ralph Vaughan Williams however it is fair to say that Hadley is beholden to no man. Lyrita are to be commended for re-releasing these two fine performances. And it is appropriate that they are recorded back to back. Of course I do not suggest that they are listened to as such. Take one at a time, read the excellent programme notes and peruse the texts before listening. However, even a cursory study of these two works will reveal much in common in both composers’ approach to life and death and the soul.